I have to tell you that as I write this email I am absolutely exhausted. I am that sort of tired where I am having trouble keeping my brain and fingers in line with each other as I try to type. I really would like to go to bed. But I am typing on. Because whilst I am overwhelmingly exhausted, my stronger feeling today is one of inspiration. And I have to share that inspiration with you. 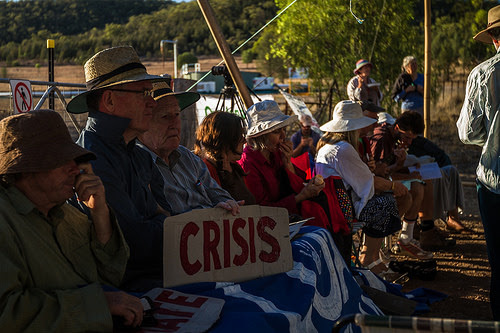 A couple of weeks ago we emailed you all about a mass convergence at Maules Creek – opposing the construction of the disastrous coal mine proposed in the region by the coal company Whitehaven. Well, I’ve just gotten back from the forest and I have to tell you about it. We’ve told you about this coal mine – the mine that will destroy the Leard State Forest which houses 34 threatened species. The mine that will spew the equivalent greenhouse gas emissions into the air as New Zealand’s entire energy system. The mine that will drain the water table, forcing farmers out of the region. 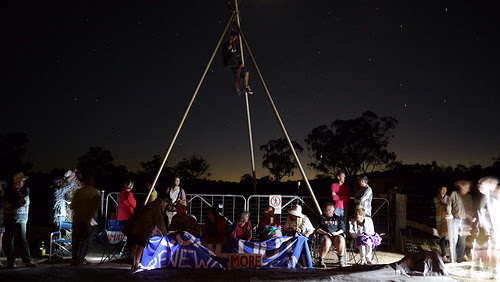 Well, on Tuesday, over 150 people took to the Leard State Forest to blockade the construction of the mine. 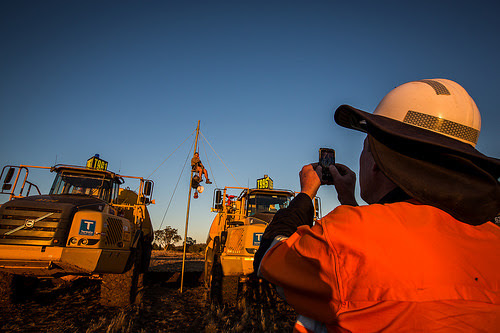 We had teams situated all around the mine site – four blocking the gates to forest, and three inside locking themselves onto equipment so Whitehaven couldn’t continue with their destruction of the forest. We held the company out for hours, seriously disrupting their work on the day. The crew were as diverse as you could think. 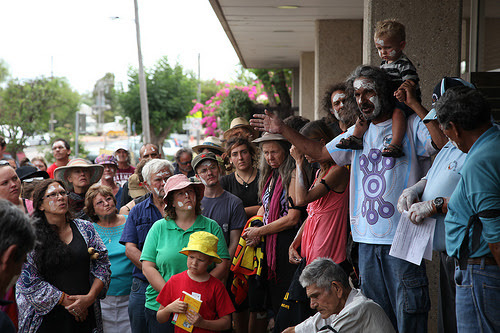 We had seasoned campaigners in this fight, and those who had never been to a protest before. We had people coming from the local community members to cities as far away as Brisbane, Sydney, Canberra, Melbourne and even Adelaide! Our ages ranged dramatically – from those in their early twenties, to Bill Ryan, a 91 year old legally blind World War Two veteran who sat in front of the main gate determined to stay there and stop Whitehaven from entering the site. Each and every person was an inspiration to me – whether they were putting themselves in a place to get arrested, or staying back and looking after the camp to make sure we all had food when we got back from the long day. Tuesday was exciting. It was inspiring. Back home now in Brisbane I am tired, but ready and excited for more. I am ready and excited to step it up again and stop this destructive mine. And that is why we need your help. We have a series of information sessions coming up where you can find out about the Maules Creek Coal Mine Campaign – whether you want to head out to the forest, or help in the city. The first sessions are happening in Brisbane and Sydney tonight, whilst there are more on their way in Canberra, Melbourne, and other cities to be confirmed! We’d love to see you there. Click here to see the details. If you can’t make it, then please get in contact, and we’ll let you know about other ways you can get involved. If you want to host your own information session as well, then we’ll provide you the support to do that. This campaign is a line in the sand. It is the time where we all have to step up and say ‘enough is enough’. 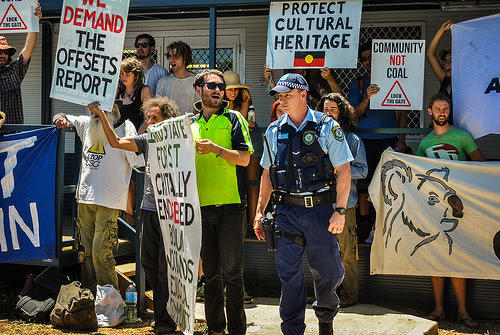 It is the time where we let the coal industry know that they will not get away with their destructive behaviour any more. I have been thoroughly inspired watching people doing this so far, but we need many more. Please come along and find out how you can help. Simon Copland and the rest of the 350.org team.